A national scholarship can go a long way, even when the recipient is a senior. 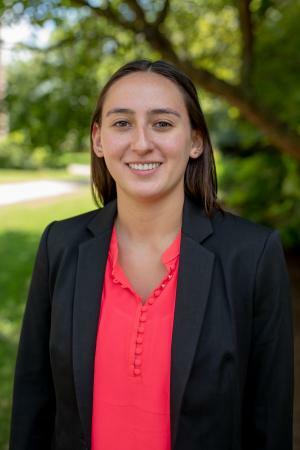 Just ask UK senior, Claire Barrera, the latest recipient of the Trjitzinsky Scholarship, one of the American Mathematical Society’s (AMS) coveted awards. Rounding out her final year as a math major and economics minor, Barrera pins her scholarly path on her upbringing. This natural knack for her field went a long way in helping her achieve this scholarship. Barrera’s skill and hard work carried her through to recognition, first from UK faculty, and then from the American Mathematical Society. The American Mathematical Society provides $3,000 at an AMS-member educational institution to a student that may be in danger of not completing their mathematics degree program for financial reasons. The AMS circulates this scholarship to different schools each year, and the school’s advisors nominate, then select one of their students to be the recipient. The students nominated are within the mathematics major program. “I was nominated by my UK advisor for the scholarship. She said it was because I had done well over the past three years, so it served as a recognition from the college for that,” said Barrera. Barrera’s academic accomplishments followed suit with her performance in the classroom, as was noted amongst many of her professors over the years. Aside from mere academic recognition, financial aid was certainly an important benefit of receiving this scholarship especially as an out-of-state student. Whether it be credited to the smaller class sizes or the quality of teaching, Barrera lauds UK’s Math Department for building her foundation for a future career. As for these future careers, Barrera is open to any opportunities within the business, finance or actuarial science fields. She has particular interest in the business sector, considering work for insurance companies. However, she has not ruled out the possibility of continuing her academic pursuits. Whether it’s continuing her scholarly pursuits or entering the workforce, Barrera’s past success and teachings from UK combined with her natural talent will certainly carry her wherever her future ambitions lead. Read more about the award and other recipients here and learn more about the Waldemar J. Trjitzinsky Memorial Awards here.